Those of you familiar with the adidas Originals archive will know, more often than not, a silhouette will be the subject of countless iterations from the moment it’s birthed. Over the years uppers change, midsole units have to be adapted due to expensive moulds ceasing to exist. Arguably, no other shoe in adidas’ long and fruitful history epitomises this more than the Vienna. Released in 1964, the unassuming track shoe was launched as a part of the coveted European City Series. The silhouette was dressed in complementing shades of white and red to reflect the colours that adorn the city’s flag, while a streamlined sole unit was engineered with a delicate ripple profile and a slightly raised heel. The culture-shifting ‘70s also brought with it a modernised edition of the Vienna. A red heel tab and rubber toe bumper were added, sitting upon an all-new ‘waffle profile’ outsole which was the precursor to that iconic Gazelle honeycomb pattern. By the 1980s, some versions had even adopted the famous ‘Jeans’ outsole, which was then coupled with a red midsole sandwiched between the upper and outsole. The 1990 execution saw the silhouette altered once again, this time opting for two blue stripes and one red, instead of the all-red detailing previously seen. In spirit of the Vienna’s ever-changing design, and the fact that the original moulds cease to exist anymore, our size? Exclusive celebrates its heritage with a custom sole unit which combines an ‘80s ripple gum sole with the split-coloured design feature seen on the memorable ‘70s release. Up top, a host of original detailing adorns the shoe’s soft leather uppers, including ‘Vienna’ lettering emblazoned in gold and signature three-stripe detailing in a vivid red hue. Our size? 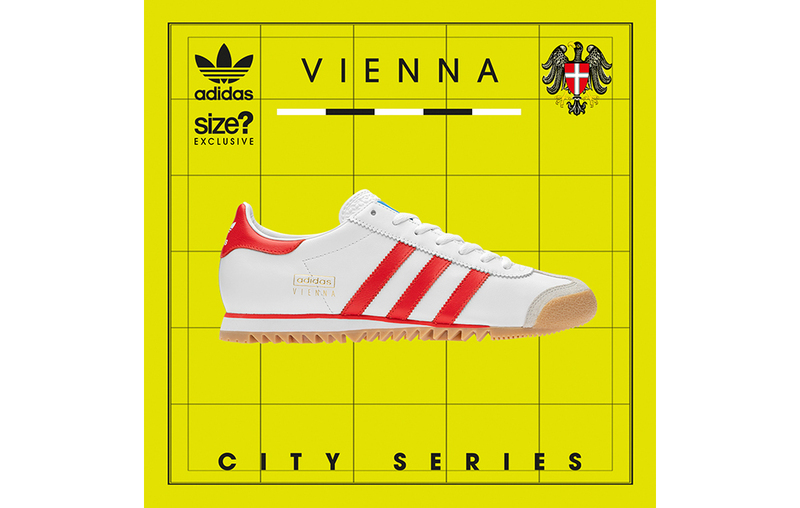 exclusive iteration of the adidas Originals City Series ‘Vienna’ will be available on Saturday 6th April via the size? previews app and in size? stores, available in men’s and women’s sizes, priced at £85.